Happy July! Wow, I can’t believe that it is already July. Why does summer seem to go by way too fast? I guess that just forces us to take advantage of the time we have. 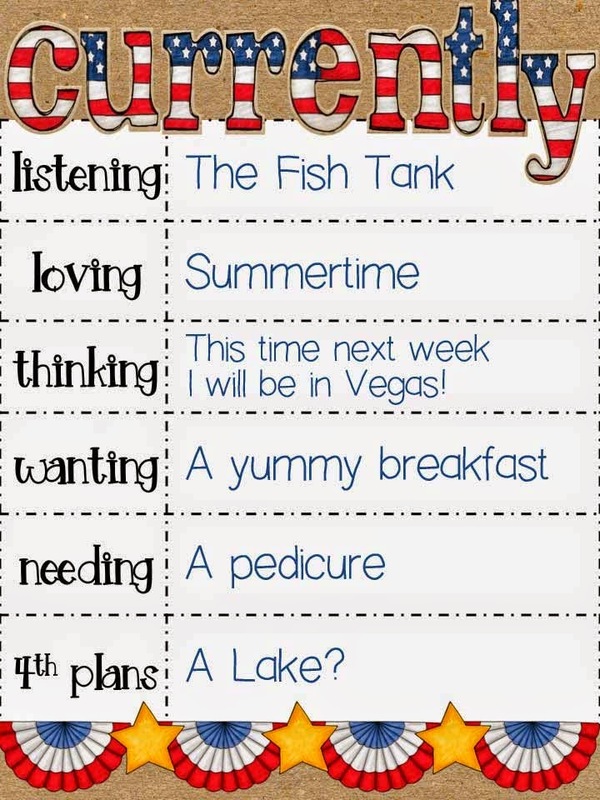 Since it is July, I am linking up with Farley over at Oh Boy, Fourth Grade for the monthly linky. Listening- I am in our office and there is a fish tank in there. My son is currently content in the family room watching some morning cartoons. Loving- Summertime! I know I have mentioned this before, but I truly love the laziness of summer. Don’t get me wrong, we get out and do something most days, but it is at our own pace. Thinking- Vegas Baby! I leave Sunday for Las Vegas to attend the I Teach 1st conference and the TPT conference. I am so excited. Time to start packing. Wanting- I am kind of craving a yummy breakfast this morning, we may have to venture off to eat somewhere yummy. I prefer and omelette type of breakfast. What is your favorite type of breakfast? Needing- I am hoping to get out for a pedicure in the next day or two. I would like to pamper my feet before next week. 4th of July- We are still working on plants, but most likely heading up to one of our nearby lakes to watch fireworks, so that is why I need to pack today. We will return from the Lake Sunday morning and then I fly out Sunday evening. Luckily, each trip requires two different types of attire for packing. There you have it! My life currently. What is happening in your life currently? Have fun at the conference Renee! I am loving the slower pace of summer too. I am craving anything with carbs for breakfast! 🙂 You should definitely get a pedicure, I just got one with my mom and it was so nice to be pampered for a bit. Have a happy 4th! P.S. Did you recently get a new blog design? I am loving the look! I am loving summer as well. Not only the free time, but the perfect pool/each weather! Have a great time in Vegas!! I wish I was going, maybe next year. I am also in need of a pedicure – may have to add that to my to do list tomorrow!